Monsta Channel, a YouTube channel owned by Animonsta Studios (Monsta) well-known for its flagship animation BoBoiBoy Galaxy, is delighted to announce that the beloved series will be back to greet its loyal fans in May and June on both TV3 and Monsta Channel, YouTube. Episodes 19 til 22 of BoBoiBoy Galaxy will be aired throughout the coming Ramadan month every Friday, 5PM on TV3, and 5.30PM on Monsta Channel starting 17 May 2018. Whereas episodes 23 and 24 will be combined into a 1-hour Season 1 Finale Special on 22 June on TV3 (5PM). What new challenges and foes await BoBoiBoy and his friends in the Season Finale? 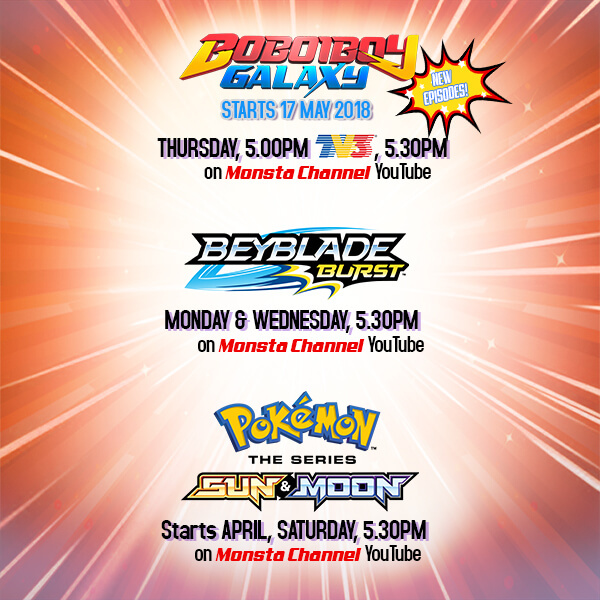 Coming soon in April, the popular Japanese animation show Pokémon will grace Monsta Channel with its latest Pokémon Sun & Moon series every Saturday, at 5.30PM. Ash and Pikachu meet new friends and Pokémon as they explore the exciting Alola Region in Pokémon Sun & Moon. An animation series from Japan based on the ever popular Beyblade brand, Beyblade Burst, is also currently streaming in Monsta Channel and is steadily gaining traction. By introducing new content such as these, we hope to develop Monsta Channel into a successful entertainment hub for animation on YouTube that is suitable for all ages, be it kids or even adults. Not only do our viewers have the chance to watch these animations for free, in high definition, and with superb audio quality, they can also do it in a safe, and legal way as we are one of the very few online streaming channels to have obtained exclusive rights to stream the selected titles in Malaysia through YouTube. You are therefore surely supporting your favourite shows by watching them on our channel! We hope to develop Monsta Channel into a successful entertainment hub for animation in YouTube that is suitable for all ages, be it kids or even adults. […] we are one of the very few channels to have obtained exclusive rights to stream the selected titles in Malaysia through YouTube. You are therefore surely supporting your favourite shows by watching them on our channel! Popular anime Beyblade Burst comes spinning into your screens this month on Monsta Channel YouTube. Until now, Monsta Channel is synonymous with BoBoiBoy Galaxy and our loyal fans have always been eagerly anticipating the release of new episodes on the channel. With the trust placed upon us, we at Monsta would like to be your gateway to various new engaging and exciting content from all around the world! Hence, we are always looking for other big brands to join our fun and awesome Monsta ‘family’ in the future. […] we at Monsta would like to be your gateway to various new engaging and exciting content from all around the world! Thanks to you, our viewers, Monsta Channel has grown into one of the leading animation streaming channels in YouTube with more than 2 billion views and dover 2.4 million Subscribers. Keep supporting us! For more info, please consider visiting these official links: Monsta Channel (Facebook), BoBoiBoy (Facebook), Monsta Channel (YouTube), and The Pokémon Malaysia Portal. It’s an amazing paragraph for all the online visitors; they will obtain benefit from it I am sure. hey monsta, can you make another reboot of powerpuff girls because I hated it you know why because its too childish and less action compared to the classic or original powerpuff girls, so please reboot it pls.